Take a trip from the past, one of the must do's if your visit includes a Bournemouth Bucket List. You may have enjoyed a fun packed day on West Beach in Bournemouth, possibly walked down the long ramp or took the zig zag down to the beach. You may wish to take a trip on one of Bournemouth's three funicular railways. Victorian Engineering to deliver you down to Bournemouth Seafront. The lift can also take you up to the Bournemouth Highcliff Marriot Hotel. There are 3 cliff lifts buit in Bournemouth, The East Cliff Lift and West Cliff Lift were built in 1908 with Fishermans Walk Cliff Lift following in 1935. The West Cliff Lift was built in 1908. It links the seafront to the Bournemouth International Centre. The East Cliff Lift was also built in 1908. It links the beach by Bournemouth Pier to the Russell Cotes Art Gallery & Museum. The Lift at Fishermans Walk was built in 1935 and links the Fishermans Walk Beach to a cliff top cafe and bistro with a childrens play area. There West Cliff Lift can sometimes be referred to as the West Cliff Railway, this is due to the fact that the lift is a funicular railway. 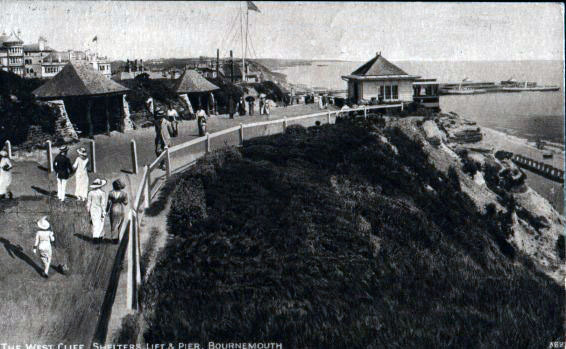 The electrically powered West Cliff Lift was opened in 1908 by Bournemouth Corporation, which was four months after the opening of the nearby East Cliff Railway. The lift is operating and in use between April and October.